Said to her shepherd: Sweet how do ye? For now the morning draweth near. Since I must go, now day is near. The majority of songs in Set VII, published in 1907, are settings of Elizabethan and Jacobean poetry. On a time the amorous Silvy, an anonymous text in John Attey’s The First Book of Ayres (1622), is a delightful pastoral narrative, coloured by a series of deft tonal deviations, the most salient of which occurs at the end (‘Since I must go’) as the shepherd wistfully departs. Thomas Heywood’s Ye little birds that sit and sing, from The Fair Maid of the Exchange (1607), and Herrick’s Julia, from Hesperides (1648) are rare examples of patter-songs. Both rely on the extensive repetition of material, yet, in both instances, Parry imaginatively varies the figuration of the piano accompaniments, subtly modifies the interludes and increasingly alters details of the vocal material. This is carried on to such an extent in Ye little birds that the elongation of the ‘warbling’ melisma in the last verse seems inevitable. Though absence seem’d my flame to qualify! As easy might I from myself depart. Shakespeare’s Sonnet CIX, O never say that I was false of heart, is an earnest declaration of love and unwavering constancy which, in view of its dedication to his wife, may well have been intended by Parry as a autobiographical statement. The emotional turbulence of the text is reflected in the marked tonal fluidity – the opening progressions in the piano and the oblique entry of the voice are but two examples. Indeed, the tonic, E flat, is only established in the closing bars, after an even more exceptional divergence to the flat submediant (C flat major), a move that underscores the most fervent statement of devotion (‘For nothing this wide universe I call’). Some ask’d how pearls did grow, and where? A bud on either cheek. To kiss the feet of Sleep. 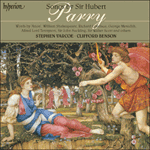 Sleep, from Sturgis’s A Book of Song, must rank as one of Parry’s finest songs. The gentle, Brahmsian figurations of the piano evoke a drowsiness that conceals an inner agitation. For a brief moment only, the song threatens to became more restless, but such emotions are restrained once more by the onset of a profound sense of tranquillity. Parry’s harmonic control in the last sixteen bars is both breathtaking and transfixing, surely constituting some of his most inspired writing for voice and piano.